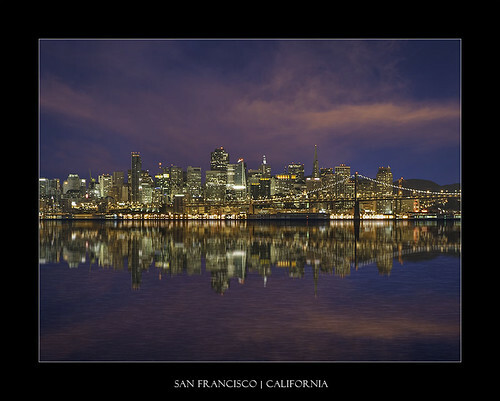 San Franscisco Reflections, originally uploaded by dmzajac2004-. Sunday morning when I reached my Plan B location to shoot the Moonset I set up, zoomed in on Financial Dist. where the Moon would not be setting, but it looked so pretty I had to take the shot. The camera told me a 30 second exposure would be good. I took the shot, but the sky and water were totally flat. Only the city gleaming in the early morning twilight looked good. So, I replaced the sky with one I took last year, and added a reflection. I’ve never added a reflection to the water via Photoshop before so that was a learning experience. I used this tutorial to do that- note he moves pretty fast. I had to stop, rewind, and re-watch throughout the whole tutorial.